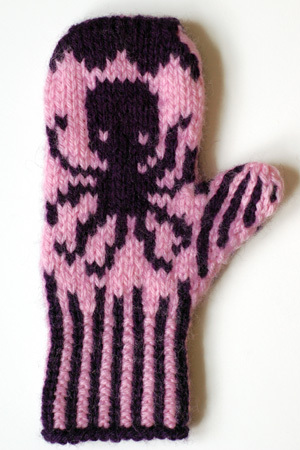 I did knit the fabulous Octopus Mittens! 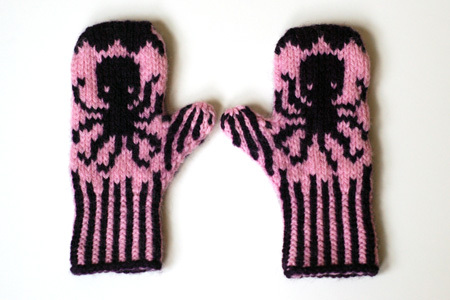 Pattern: Octopus Mittens by Elliphantom Elli from 60 Quick Knits: 20 Hats*20 Scarves*20 Mittens in Cascade 220 (read my review here). Yarn: Cascade 220 (the one! the only! the original!) in tutu (9477) and regal (7807). Sub-skein amounts of each, though I’m not sure exactly how many yards. Choosing a color combination for this pattern wasn’t as complicated as I originally imagined. Many options were possible, but I think pink and dark purple are exactly right. First, there’s pink, which I was warned by many readers is a “must” if the little girl is to actually wear the mittens. Second, the palms are dark – I know that’s where my own mittens and gloves get dirty the quickest. Third, the octopus is dark purple! That makes the scientist in me very happy. Needles: Bryspun dpns, US 5 and 6, as recommended. Size and gauge: My gauge was 27 stitches and 25.3 rounds per 4″ in the colorwork pattern. This is definitely tighter than the recommended 23 stitches/4″ (as stated in the book – Ravelry quotes yet another gauge), and probably explains why my mittens look so long and narrow. The finished dimensions are 4.75″ palm circumference, 4.375″ long from the base of the palm to the top of the mitten, and 6.375″ total length. I don’t have any children to try this on for size, but I’m guessing this would fit a 4 or 5-year old. The pattern was very simple and quick to knit. Everything was charted, with a separate chart for left and right mittens. Since I wasn’t making any yarn substitutions or size adjustments, I just used the cited needles and followed the instructions. Something went wrong with the thumbs, however – they seemed too narrow, and looked disproportionate compared to the rest of the mitten (see my differing gauge, above). I couldn’t even stick my pinkie in them. So I frogged the original attempt, picked up an additional 4 stitches at the point where the thumb meets the hand, and I think they seem so much better now. Another modification which I would recommend regardless of anything else is the following: after casting on and joining in the round, work 1 round of *k1 with B, k1 with A; rep from * around, before launching into the corrugated rib. This will prevent those contrasting purl bumps during the first round or ribbing. I must admit that these mittens tested my limits of “fiddly-ness”. They are so tiny, and turning them inside and out multiple times to weave in the ends was hell. 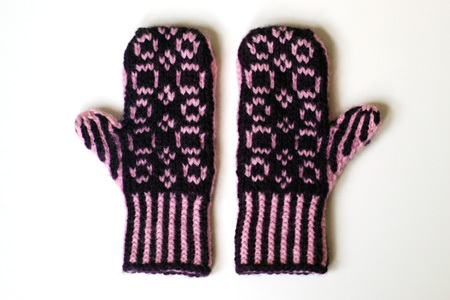 Did I mention that I decided to redo the thumbs after the mittens had been blocked? Undoing the ends of this extremely-felt-friendly wool was an exercise in patience. I also think in the process of all the knitting, handling, and un-knitting, etc., the whole thing felted a little. Sigh… Slightly felted is great for mittens, actually, but maybe I’ll use superwash wool next time, just in case? I’m okay with it now because the mittens are so darn cute, but the finishing was trying. OMG these are adorable. Worth all the work, I think! Those are super cute. My DD loved all the mittens I made for her last fall, but I didn’t make her any girly ones. Maybe this year. Well done! They are very cute! Elliphantom designs the most lovable mittens! They are super sweet, I love the colour combination. Very cute! Check out my real octopus movie from our local aquarium visit…not as cute! They are so cute! I had to order the book right away. They are lovely! And they’re the first finished octomitts, which gives them a special place in my heart! A note on gauge: The gauge listed on Ravelry is correct. I don’t have my book here to check what ended up in print, but the pattern I turned in listed 22 sts/24 rnds = 4″ in St st and the charted pattern. Some of your difference in gauge may have been because you used classic 220 instead of superwash…I knitted two patterns for the book (one in classic and one in superwash) and I had two different gauges. Classic was 24 sts and 26 rows, and Superwash was the 22 sts/24 rnds = 4″ mentioned above (both gauges are in St. st and stranded colorwork). So superwash does seem to be a little more beefy. Regarding thumbness, yes it is hard to knit that tiny little thumb to gauge…there is a tendency to knit it tighter because of the small number of sts and the weight of the mitten. Adding a few stitches is a totally legit save! It also helps to block the thumb with a blocking template inside (cardboard covered in plastic works well). Glad to read your review and Elli’s comment. I purchased the book because I love Cascade 220, but mostly for this mitten pattern. I got a blue and orange to make them for my daughter, but I think I didn’t get the superwash, so I will keep these notes in mind, thank you! Very cute – love the color combo! Oh my goodness! These are absolutely adorable! Another reason for me to pick up this book. And I find that finishing mittens (regardless of size) can be a bit fiddly with all that turning inside out and what not but I imagine it was especially a challenge with these little mittens. Good job! It like the black and pink combo. You ought to be proud of yourself. Beyond cute and well into adorable! So so cute! I have a 3 1/2 yr old grandgirl who only wants to wear purple and pink. For her there are NO other colors. So perfect!! But, octopus! The only way it could be better (for me) is if it was a cuttlefish! These are too cute! You make me want to try my hand at colorwork. Thanks for the inspiration. And the suction cups are pink! L-o-v-e these…and the color combo is just perfect! That’s a pair of lovely glove, congratulations. Oh, I bet they’re toasty warm, too! Isn’t knitting fun when it brings smiles to everyone’s face. Great job! Squee! Decidedly delicious mittens, Kathy. Wicked cute.